The Antique Business (in 1966). In amongst the archive materials that our friend Robin Butler kindly donated to the research project (thank you again Robin!) I discovered something I’d been searching for for the last 3 years – Howard Coutts (curator at The Bowes Museum) mentioned an interesting Sunday Times Supplement from the 1960s, which was, so Howard remembered, devoted to the ‘Antique Trade’. I’d been struggling to find a copy of the Supplement since Howard mentioned it to me, as they were not part of the extensive (and so useful) digitization project of The Times online (which I have access to at the University). Anyway, I’d almost given up ever finding a copy of this elusive, but potentially fascinating, publication. And then….Robin had kept a copy of it in amongst the ephemera in his archive! And it was worth saving. Here’s the front cover of the Sunday Times Supplement, August 14th 1966. Sunday Times 1966 ‘Special Insight Analysis: The Antique Business’ – it does not appear to have named authors and appears to have been composed by a team of Sunday Times journalists over a period of 6 months of investigation. It’s structured around a kind of ‘how to deal with dealers’ series of short articles, starting with ‘Plain Man’s Guide to the Dealers and the Deals’, with ‘buying guides’ and ‘How to Sell’ etc etc. It also, inevitably I suppose, has a salacious tale of fakes and forgeries – ‘A Cautionary Tale of Two Blackamoors’; supposedly a cache of ’18th century’ figures, which were, according to the reporters, recently made in some studios in Homer Street, London W1 – I’m very interested in this trope of the ‘antique dealer’ associated with fakery and forgery….and keen to unpack this cultural stereotype further – I’ve been working on a text on the social and cultural identity of the antique dealer in the 19th and 20th centuries for a number of years…..
We will be making more use of the Sunday Times Supplement as part of out research, but it was such a brilliant thing for Robin Butler to keep safe….thanks again Robin! 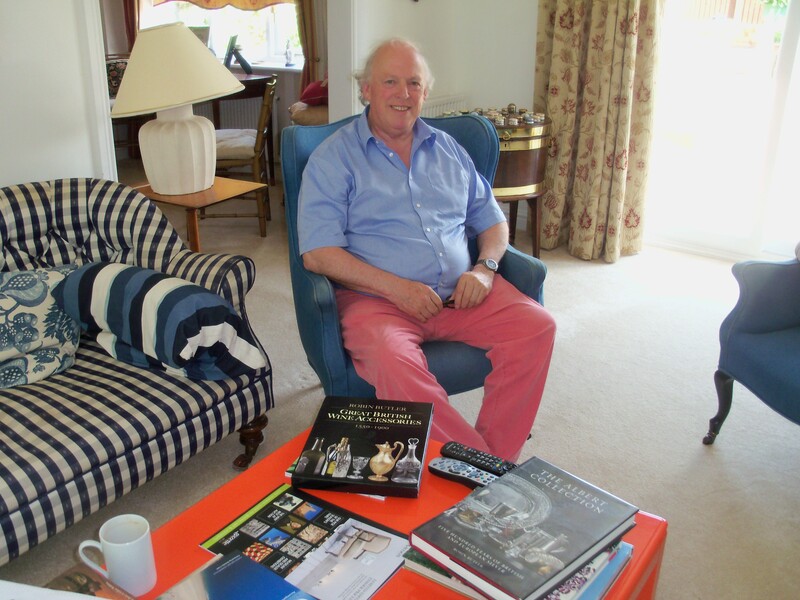 Thank you to antique dealer Robin Butler – Butler’s Antiques – for generously being an interviewee for the Antique Dealer Project. Robin has been in the trade for over 50 years, having first started in the father’s antique business, G. Noel Butler, in Honiton, Devon in the late 1950s. Here’s Robin, at his home in Braintree. We hope to put some extracts from the oral history interviews on the project website over the next few weeks, so keep you eye on the project! Antique Dealers support the project!